Yesterday, we stumbled upon what’s either the world’s kitschiest haunted house or a clever bit of viral marketing for that upcoming It adaptation. 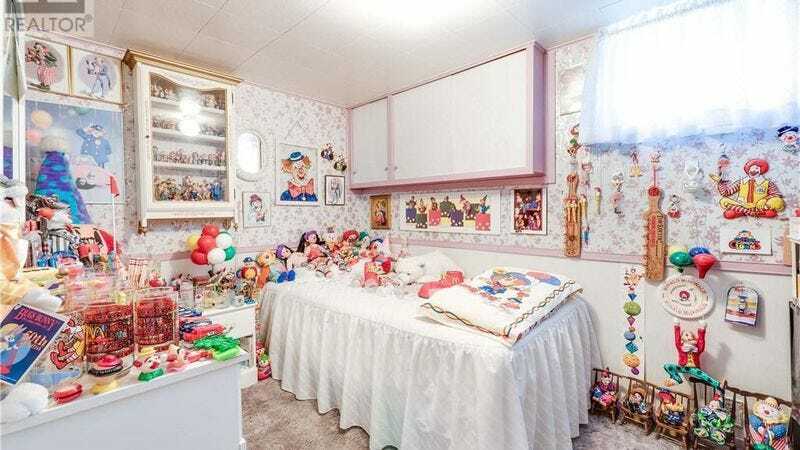 It’s a ranch-style home for sale in Brantford, Ontario, and while it looks trim and well-maintained on the outside, the inside is occupied by what seems like hundreds of clowns. Previously, the only answers we had were the ones lurking on the edges of our nightmares. Today, thanks to Vice, we have a better understanding of these clowns and their proliferation and, while it’s not necessarily scary, it’s certainly weird. Vice reached Michael McMannis, son of the owners (who’ve lived in the house for 30 years) and confirmed that the family is not in fact related to It or any other deranged clowns. No, they’re actually a cute elderly couple in their 80s who started buying the clowns in an effort to keep McMannis’ stepfather from boozing. The collection’s been built up for around 25 years and currently comprises roughly 1,500 clowns. McMannis also reveals that they weren’t in the habit of collecting the clowns, necessarily; rather, they were simply symbolic of the elder McMannis’ victory over alcoholism. As for the fate of the clowns? After the house is sold, they’ll apparently be boxed up in the crawl space of McMannis’ home instead of tossed into a giant, unholy bonfire. It’s hard to tell which image is more frightening.